Sign up for Broadjam today to follow Tommy Malta, and be notified when they upload new stuff or update their news! 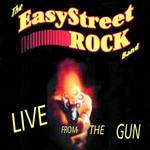 EP length live release chronicling a formative period of the Easystreet Rock band. Highlights include raw versions of "Black Roses" and "Beautiful Pleasure". Both of these cuts reveal the artist's potential for heartfelt rock ballads that leave their hook in you.